Google has introduced a new version of Google Earth which have been added detailed information about the ocean pastures and the possibility of monitoring changes in glacier and other geographical locations over time. Google Earth 5.0 presented at the event in San Francisco where it was announced the former American vice president, Al Gore, said that it is a powerful tool for increasing awareness of changes in the environment, such as global warming. 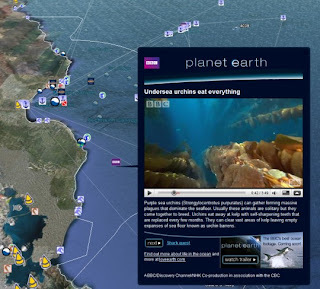 Using photographs and video recordings of fish and other marine animal partners such as National Geographic Society, the new Google Earth allows users to "dive" deep into the sea and move above the seabed. The company stressed that they used sonar data collected by the U.S. Navy and other organizations to create a topographic presentation of the landscape hidden beneath the sea. Apart from the ocean, Google is in a new version, introduced and three-dimensional maps based on the Martian satellite images as well as a panoramic photograph taken from the robotic vehicles that have been down on Mars. There is a function for viewing the changes through time, or a series of satellite recordings taken at specific locations throughout a longer period of time in order to better able to perceive changes in the environment.